This is what my reaction is almost every time I visit the fish stall. And then end up buying it. Mom and granny prepares yummy Goan style Prawns curry, Prawns Fry and Prawns Sukka ( click on the link to see the recipe).I experiment with different dishes. 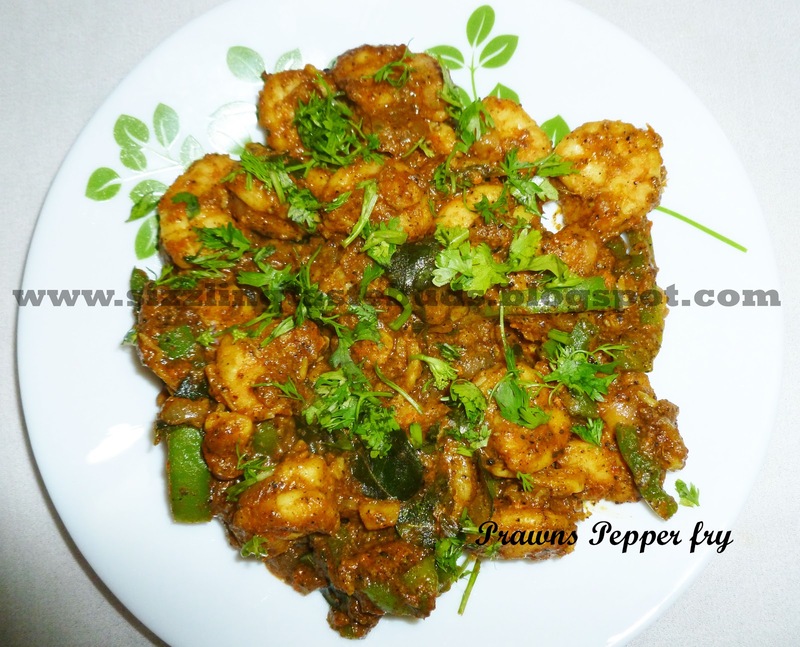 One among those is Prawns Pepper Fry. I usually prepare chicken pepper fry. But this time i gave a try with prawns or say " fresh prawns". I am stressing "fresh" just because its very difficult to get fresh seafood in cities as we get in our coastal regions. This recipe is so simple and the taste is just fantastic. Sea food lovers, I am sure you will love this. Enjoy. Onions - 2 medium sized chopped. Garlic cloves - 6-8 peeled and chopped. Fresh Coriander leaves choppped for garnishing. 1. Clean the prawns and keep aside. 2. Heat 2-3 tsp oil in a pan and add curry leaves,chopped garlic and onions. Fry till onions turn slightly brown in colour. Add ginger- garlic paste and fry for another 2 mins. 3. Add cleaned prawns,haldi with little water. Allow it to cook for 4-5 mins closing the lid. 4. Now add all the dry powders, soya sauce and salt. Add capsicum if you like the flavour. Close the lid and cook for few more mins. 5. When the prawns are cooked, shift it to the serving bowl and garnish with fresh coriander leaves. Hot and spicy Prawns pepper fry is ready to serve. Serve this with rice and rasam or curd rice or anything you like. Enjoy this spicy and tasty dish and do let me know how it tasted.